Order The Accurate Handgun to hit the target everytime with expert guidance from Robert Campbell including markmanship, gun tests like Sig Sauer, & more! Categories: Gun Digest Publications, Pistols and Revolvers, Shooting, Concealed Carry, Handguns SKU:: R6006-m Format:Digital Book (PDF), Paperback ISBN: 9781946267009. The Accurate Handgun arms shooters, hunters, and armed citizens with the resources they need to always hit the mark with their pistols and revolvers. Deftly written and easy to grasp, this expansive look at handguns, upgrades, accessories, mindset, and skills enable shooters to milk every ounce of accuracy from a sidearm. It truly is a must-have resource for serious marksmen looking for an edge or novices aiming to ground themselves in fundamentals of precision handguns and handgun shooting. 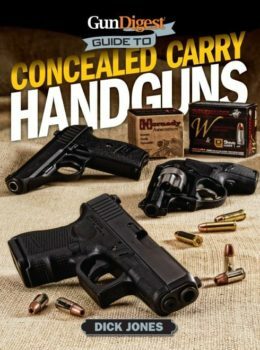 Authored by respected gun writer and expert Robert Campbell, the book does exactly what the title implies, taking readers step-by-step through every facet of accurate handguns. In-depth gun tests of Glock, Colt, SIG, CZ, Springfield Armory and many more let shooters know which makes and models perform best at what tasks. Honest assessments of the latest handgun ammunition and reloading tricks put pistols and revolvers on a strict diet of precise fodder. And a comprehensive assessment of the dizzying array of accessories and upgrades demystifies this often-confusing aspect of handguns. Along with pointers on the fundamentals of handgun marksmanship, you’re certain to hit the mark after reading this book. Whether you’re a weekend warrior shooting for tighter groups, a serious IDPA pro looking for a competitive edge, or an armed citizen aiming for a lifesaving advantage, The Accurate Handgun delivers. How Accurate are Factory Handguns? Robert Campbell is a contributor to American Gunsmith, Handloader, Gun Tests, Handguns, Gun World, and SWAT magazines and is the author of Gun Digest Shooter’s Guide to the 1911, 1st and 2nd Editions. He has authored Dealing with the Great Ammo Shortage, Commando Gunsmithing, Holsters for Combat and Concealed Carry, The Handgun in Personal Defense, The Hunter and the Hunted, Illustrated Guide to Handgun Skills, and the Ultimate Guide to Gunfighting. Campbell is a certified NRA instructor, and has taught thousands of shooters, including police and military.